Term signifying originally the flesh of a clean animal that had been torn or mortally wounded by beasts of prey, and had been rendered thereby unfit for food. 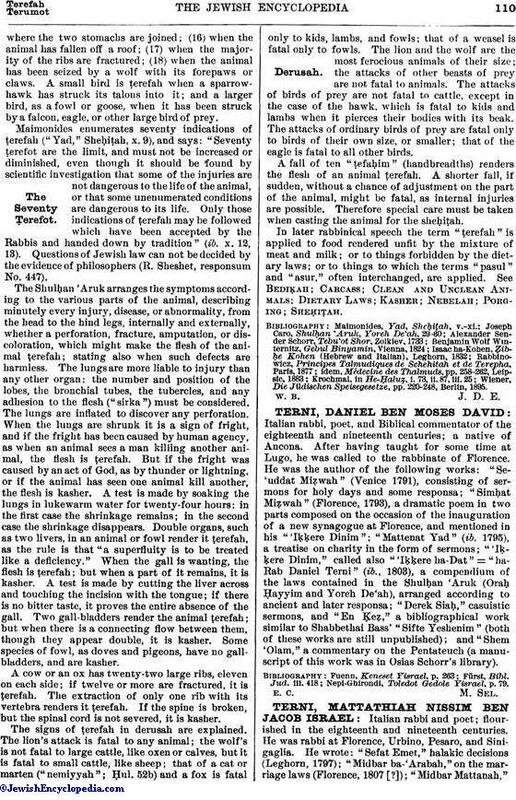 In rabbinical literature the word came to be applied to the flesh of an animal that had received a fatal injury, or suffered any one of certain diseases, or was marked by some physical abnormality, but which otherwise would be "kasher" (fit and proper as food). "Ṭerefah" in a broader sense includes also a regularly but unskilfully killed animal, in contradistinction to Nebelah, which refers to the carcass of a clean animal that has died an unnatural death or been killed irregularly (comp. Ḥul. iv. 2). Both flesh that is nebelah and flesh that is ṭerefah are forbidden as food by the Mosaic law (Lev. xxii. 8). The Talmudic rule is that when an animal is so injured that it can not live, its flesh is ṭerefah; hence only such injury, disease, or abnormality is involved as must cause an untimely death and affect the health of the animal at the time it is slaughtered (Ḥul. iii. 1; 42a). According to 'Ulla, the Mosaic law recognizes eight principal ṭerefah signs, as follows: (1) "derusah" (violent attack by beast or bird of prey); (2) "neḳubah" (perforation of a vital organ); (3) "ḥasurah" (natural deficiency of an organ); (4) "neṭulah" (loss of an organ); (5) "ḳeru'ah" (a rent in the body); (6) "nefulah" (a fall that might cause internal injuries); (7) "pesuḥah" (severance or dislocation of a limb); (8) "sheburah" (fracture of a rib or other bone). In each of these classes there are a number of cases. The Mishnah gives a list of eighteen principal ones: (1) when the gullet ("wesheṭ") is punctured or perforated, the hole penetrating to the interior; (2) when the windpipe ("gargeret") is split or torn across its width; (3) when the membrane ("ḳerum") nearest to the brain is perforated; (4) when the heart is pierced as far as one of its ventricles; (5) when the spine is broken and the spinal cord is severed; (6) when the liver is entirely wanting; (7) when there is a perforation through the two membranes covering the lungs; (8) when the lungs lack any of their lobes, (9) when there is a hole in the maw, or (10) in the gall-bladder, or (11) in the intestines; (12) when there is a hole in the interior, or lower, stomach, or when (13) the greater part of the flesh covering the stomach is torn; (14) when there is a perforation of the omasum ( = "manyplies"), or (15) in the greater venter, or upper stomach, beyond the placewhere the two stomachs are joined; (16) when the animal has fallen off a roof; (17) when the majority of the ribs are fractured; (18) when the animal has been seized by a wolf with its forepaws or claws. A small bird is ṭerefah when a sparrow-hawk has struck its talons into it; and a larger bird, as a fowl or goose, when it has been struck by a falcon, eagle, or other large bird of prey. Maimonides enumerates seventy indications of ṭerefah ("Yad," Sheḥiṭah, x. 9), and says: "Seventy ṭerefot are the limit, and must not be increased or diminished, even though it should be found by scientific investigation that some of the injuries are not dangerous to the life of the animal, or that some unenumerated conditions are dangerous to its life. Only those indications of ṭerefah may be followed which have been accepted by the Rabbis and handed down by tradition" (ib. x. 12, 13). Questions of Jewish law can not be decided by the evidence of philosophers (R. Sheshet, responsum No. 447). 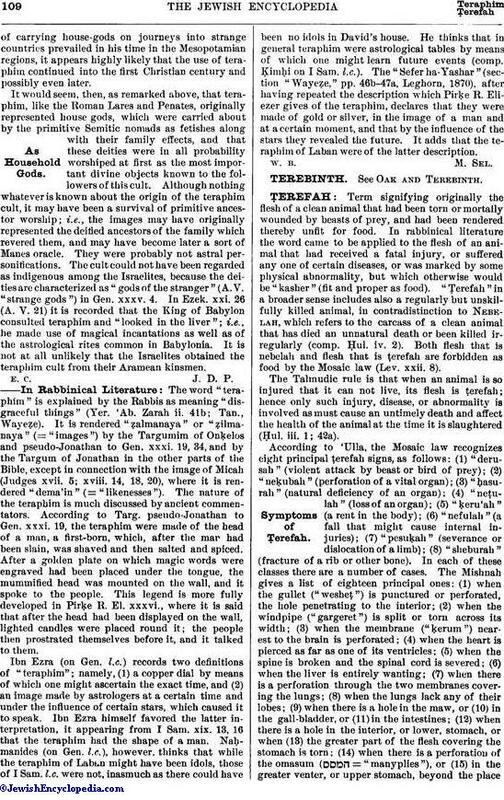 The Shulḥan 'Aruk arranges the symptoms according to the various parts of the animal, describing minutely every injury, disease, or abnormality, from the head to the hind legs, internally and externally, whether a perforation, fracture, amputation, or discoloration, which might make the flesh of the animal ṭerefah; stating also when such defects are harmless. The lungs are more liable to injury than any other organ: the number and position of the lobes, the bronchial tubes, the tubercles, and any adhesion to the flesh ("sirka") must be considered. The lungs are inflated to discover any perforation. When the lungs are shrunk it is a sign of fright, and if the fright has been caused by human agency, as when an animal sees a man killing another animal, the flesh is ṭerefah. But if the fright was caused by an act of God, as by thunder or lightning, or if the animal has seen one animal kill another, the flesh is kasher. A test is made by soaking the lungs in lukewarm water for twenty-four hours: in the first case the shrinkage remains; in the second case the shrinkage disappears. Double organs, such as two livers, in an animal or fowl render it ṭerefah, as the rule is that "a superfluity is to be treated like a deficiency." When the gall is wanting, the flesh is ṭerefah; but when a part of it remains, it is kasher. A test is made by cutting the liver across and touching the incision with the tongue; if there is no bitter taste, it proves the entire absence of the gall. Two gall-bladders render the animal ṭerefah; but when there is a connecting flow between them, though they appear double, it is kasher. Some species of fowl, as doves and pigeons, have no gallbladders, and are kasher. A cow or an ox has twenty-two large ribs, eleven on each side; if twelve or more are fractured, it is ṭerefah. The extraction of only one rib with its vertebra renders it ṭerefah. If the spine is broken, but the spinal cord is not severed, it is kasher. The signs of ṭerefah in derusah are explained. The lion's attack is fatal to any animal; the wolf's is not fatal to large cattle, like oxen or calves, but it is fatal to small cattle, like sheep; that of a cat or marten ("nemiyyah"; Ḥul. 52b) and a fox is fatal only to kids, lambs, and fowls; that of a weasel is fatal only to fowls. The lion and the wolf are the most ferocious animals of their size; the attacks of other beasts of prey are not fatal to animals. The attacks of birds of prey are not fatal to cattle, except in the case of the hawk, which is fatal to kids and lambs when it pierces their bodies with its beak. The attacks of ordinary birds of prey are fatal only to birds of their own size, or smaller; that of the eagle is fatal to all other birds. A fall of ten "ṭefaḥim" (handbreadths) renders the flesh of an animal ṭerefah. A shorter fall, if sudden, without a chance of adjustment on the part of the animal, might be fatal, as internal injuries are possible. Therefore special care must be taken when casting the animal for the sheḥiṭah. In later rabbinical speech the term "ṭerefah" is applied to food rendered unfit by the mixture of meat and milk; or to things forbidden by the dietary laws; or to things to which the terms "pasul" and "asur," often interchanged, are applied. See Bediḳah; Carcass; Clean and Unclean Animals; Dietary Laws; Kasher; Nebelah; Porging; Sheḥiṭah. Wiener, Die Jüdischen Speisegesetze, pp. 220-248, Berlin, 1895.